Click the Gods, Goddesses and Mythology database link above. KEYWORDS: You can type your country/culture's name into the keyword box or scroll down the alphabetized list of article titles. CHOOSING ARTICLE: If you used the keyword box, select the article with the title of your country or culture. The article is separated into several sections which you can go to by clicking the section heading in the far left navigation box. CITATION INFO: Scroll to the bottom of any section of the article. The citation information is in MLA format. EMAIL/PRINT: Email or Print buttons are in the green bar at the top of the article. The articles can be long so email or print the sections you are interested in. Click World Book link above. KEYWORDS: Type your keywords in the search box. Click Search. 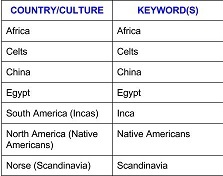 Keywords for this research would be your country/culture or the word mythology.